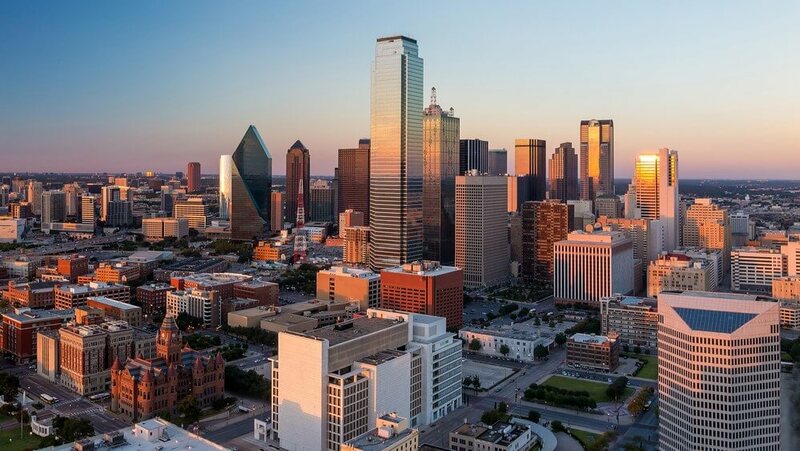 Dallas overtook New York as the top job growth market in the year-ending April 2018, as hiring at the national level held steady. According to preliminary data from the Bureau of Labor Statistics, U.S. employers added nearly 2.3 million jobs in the year-ending April 2018, growing the nation’s job base 1.6%. This is the third consecutive month with job growth just shy of 2.3 million positions. Meanwhile, unemployment remained at a very low 3.7%. 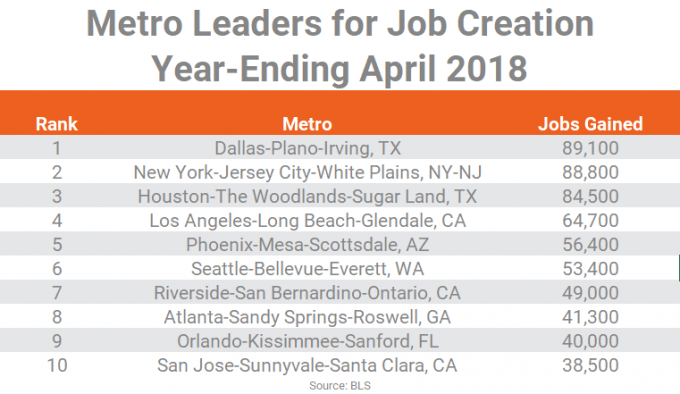 Among U.S. metropolitan areas, nine of the top 10 metros from March returned to the list in April, although there was some movement among the positions. Dallas moved into the top spot with the addition of 89,100 jobs in the year-ending April. This move displaced New York, which had held onto the top rank for six consecutive months. The Big Apple wasn’t far behind in April, with 88,800 new jobs. Houston was in the #3 spot, with the gain of 84,500 positions in the year-ending April. While the metro inched up only one position, this new annual job total is a hefty 19,100 jobs ahead of the gains Houston logged in March. Los Angeles moved up one spot to #4 with 64,700 jobs gained, while Phoenix dropped from the #3 position to round out the top five with 56,400 jobs for the year. 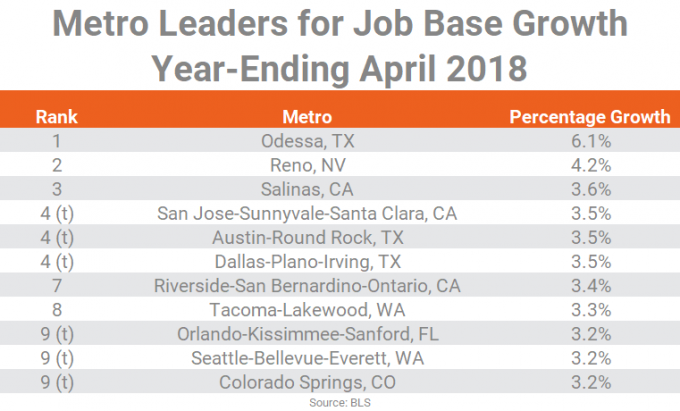 The next four spots in the national job growth leaderboard remained the same as last month with Seattle, Riverside, Atlanta and Orlando returning to the list. San Jose was the only newcomer to the top 10 with annual gains of 38,500 positions. Austin slipped out of the list, coming in at #13 in April. The top 10 job annual gain markets in April 2018 accounted for 605,700 positions added – roughly 27% of the nation’s total job gain during that period. That recent figure was a significant 137,000 jobs ahead of the 468,700 positions those same 10 markets accounted for in April 2017. Houston was a prime leader in that upturn, with annual growth standing a significant 67,900 jobs ahead of the gains seen last year. Los Angeles logged significant gains of 38,900 positions year-over-year, while Dallas and San Jose saw upturns around the 20,000-job mark. Most of March’s top 10 annual percentage growth leaders returned to the list in April, though most of those that remained were reshuffled. Odessa held onto its top position among national leaders in the year-ending April, though the voracity of growth in the Texas market waned, falling to 6.1% after registering between 6.6% and 7.5% for three consecutive months. Reno and Salinas changed places this month. Reno climbed to second place with 4.2% job growth in the year-ending April, while Salinas fell to the #3 spot with a 3.6% increase. Three metros tied in the #4 position, with job base growth of 3.5% in the year-ending April. San Jose was a newcomer to the list, shooting up from its #14 spot in March. Meanwhile Austin held steady to its ranking from last month and Dallas moved up from the #9 position. Riverside fell one rank to land at the #7 spot, with 3.4% job base growth in the year-ending April. Tacoma was not far behind at 3.3%, but that showing represented a huge jump from the #61 position this metro was in last month. Tying at #9 with 3.2% annual growth in April were Orlando, which was in the same spot last month, Seattle, which took a dive from its #6 position from March, and new arrival Colorado Springs. Phoenix, Jacksonville, Athens and Fresno were the four metros that made it in the top 10 list in March, but fell out of the nation’s top rankings in April. While most of these markets are still logging growth of 2.5% to 2.8%, Athens has seen growth fall considerably, tumbling to just 1.9% in the year-ending April.